New York Yankee outfielder Roger Maris, of Fargo, North Dakota, is best known for hitting sixty-one home runs in 1961. His 61 in '61 set a new major league baseball record, breaking Babe Ruth's previous mark of 60 hit in 1927. Roger and teammate Mickey Mantle entertained baseball fans throughout the summer of '61 as the two New York Yankee sluggers chased the record many called the most cherished in all of sports. Mickey dropped out of the home run race early due to an injury, but finished with a career high 54 home runs. Roger tied Ruth on September 26, hitting his 60th home run. He hit his 61st home run on the final day of the season, October 1, 1961, against the Boston Red Sox to set a new record. The Yankees won the game, 1 to 0, and later went on to win the World Series. Roger was voted the Most Valuable Player in the American League for the second straight year, as he led the league in home runs and runs scored. He was also named the Associated Press' Male Athlete of the Year. 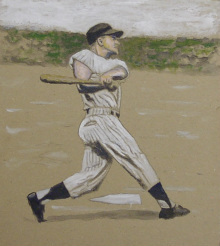 During his career, Roger Maris played in seven World Series and seven All-Star games. He hit 275 career home runs and won the Gold Glove Award for outstanding defensive play. The New York Yankees retired his number "9" in 1984. Roger founded Maris Distributing Company, an Anheuser-Busch distributorship, in 1967 with his brother Rudy, which he operated until his death in 1985. In 1998, Roger's home run record was surpassed by Mark McGwire and Sammy Sosa, both from the National League, 37 years after the 1961 season. Roger Maris became one of the few baseball players ever featured on a United States postage stamp when the United States Postal Service issued its "Roger Maris, 61 in 61" stamp in 1999. Billy Crystal's acclaimed film, 61*, starring Barry Pepper and Thomas Jane, about the home run race in 1961, premiered in 2001. The film was re-released on blue ray DVD in 2011. In 2011, the New York Yankees celebrated the 50th year of Roger's American League Home Run record, which remains unbeaten.